Auntie Mame was one of the first characters you nominated when we launched In Character early this year. We heard you -- though I imagine, judging from the warmth of the memory-piece he turned in, that Bob Mondello didn't need much encouragement. Below, I've surfaced Michael Whistler's original nomination essay, originally posted here back in January. And you can listen to Bob's radio piece -- and see clips from the film -- on the story page. 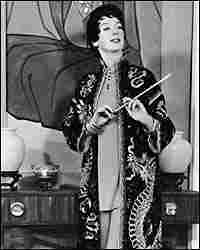 My mother deemed one movie important enough for repeated family viewing: Auntie Mame, based on the novel by Patrick Dennis and starring the unforgettable Rosalind Russell. Mame Dennis challenges her young charge Patrick to "Live! Live! Live!," presenting a world which is filled with miracles and not obstacles, hope instead of despair. Amid the chaos she creates, she ensures that he lives in a world filled with warmth, vivacity, charm, culture, adventure and beauty. Sitting in that living room watching the movie, I could see the world my mother tried to offer me through Mame's - one where wit trumps power, charm overcomes fear, and generosity is the greatest act of human courage. Auntie Mame taught me the simple virtue of human love: the bravest person has the most to give, the most fearful has the least of all. In short: Auntie Mame taught me to be a man.